Once upon a time . 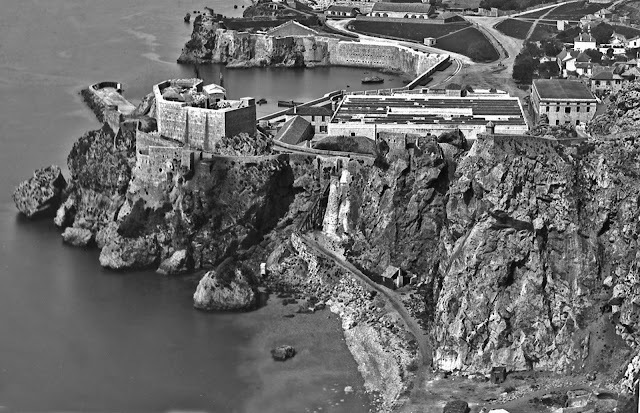 . . in those far off days when Spain ruled the roost in Gibraltar - the small bays and coves of the south west of the Rock were known as calas or ensenadas and were named after nearby Catholic chapels which were found all over the place in the area at the time. After 1704, however, the continuing British presence on the Rock soon led to the inevitable Spanish to English name changes to all sorts of buildings, bastions and streets. The names of the south western bays were no exception. Over the years, Cala de Europa became Europa Bay, Cala de los Remedios, Camp Bay and Cala de San Juan, Rosia Bay. 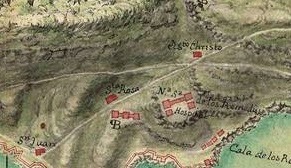 Map makers were slow to adopt the English nomenclature although Rosia Bay was one of the first to make its appearance. There was also an odd reluctance to lose any of the original names. 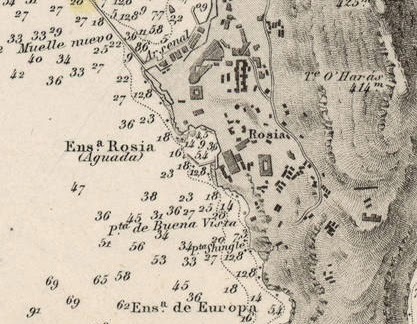 It meant that whereas Rosia Bay took the place of La Cala de San Juan Verde, the latter continued to appear on maps as just north of Rosia Bay and south of the New Mole. 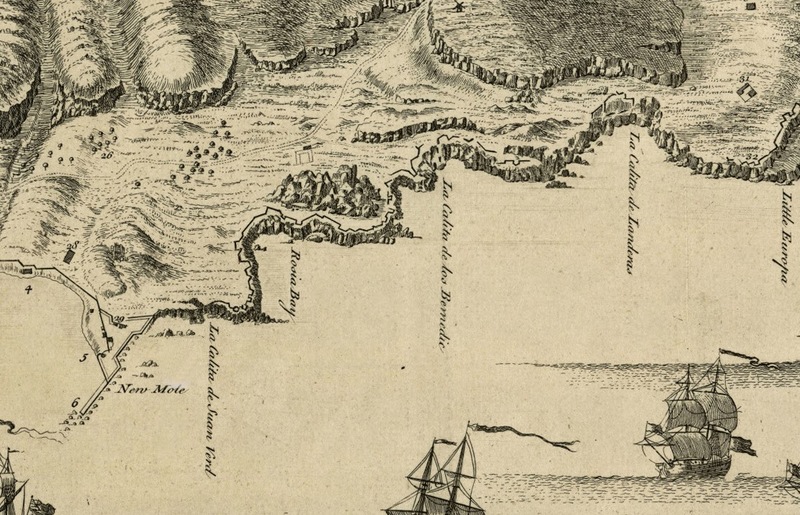 The reasons behind the choice of these names was probably quite trivial - there were military camps just above Camp Bay in the 17th and 18th century, and Little Bay is indeed rather small. But the rational for calling Rosia Bay - and a considerable chunk of the surrounding countryside - after a relatively obscure chapel is less easy to understand, especially when one considers that the name of the chapel itself is spelt differently everywhere one looks - from Rocio, which means 'dew' to Rosa and Rose - not to mention Rosio and Rosia, both of which are meaningless. That some sort of building with a name corresponding to at least one of these varieties actually existed is unarguable. 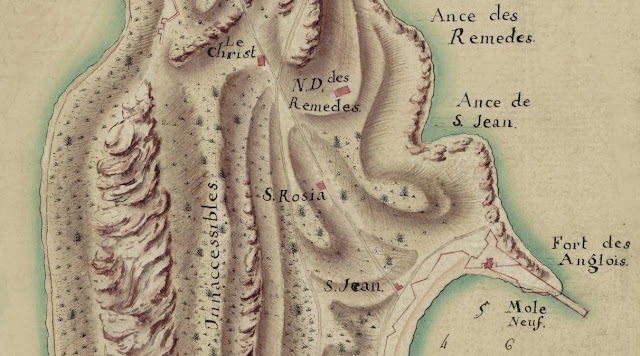 There is an embarrassment of 18th and 19th century maps pinpointing the chapel in question as either Rosia or Rose - although never by its presumed proper name of Rocio. As regards very early British literature on Gibraltar, Rosia is only noticeable for its absence. 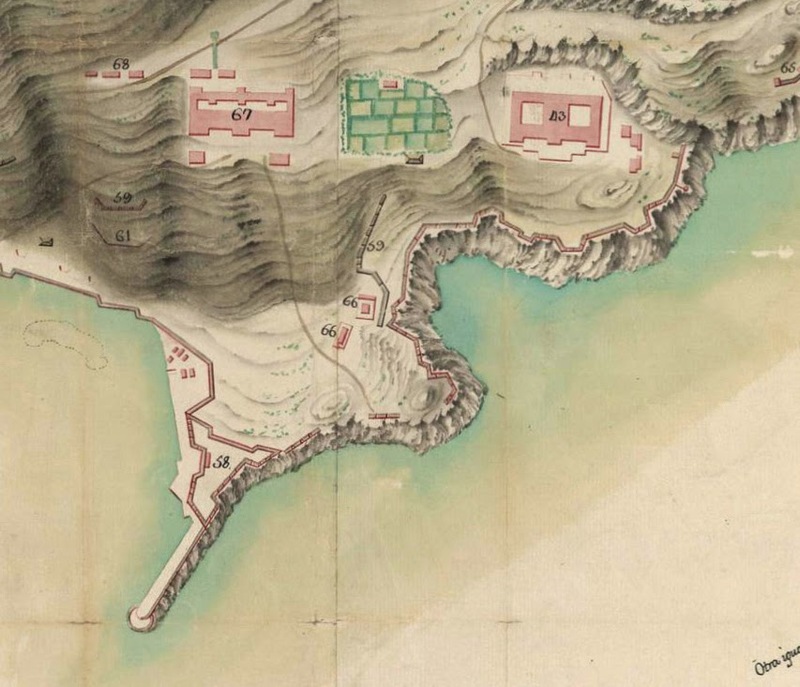 However, according to Alonso Hernández del Portillo, ( see LINK ) most of area behind these coves - from the sea perhaps right up to the cliff face - was mostly occupied by well cultivated orchards and gardens. 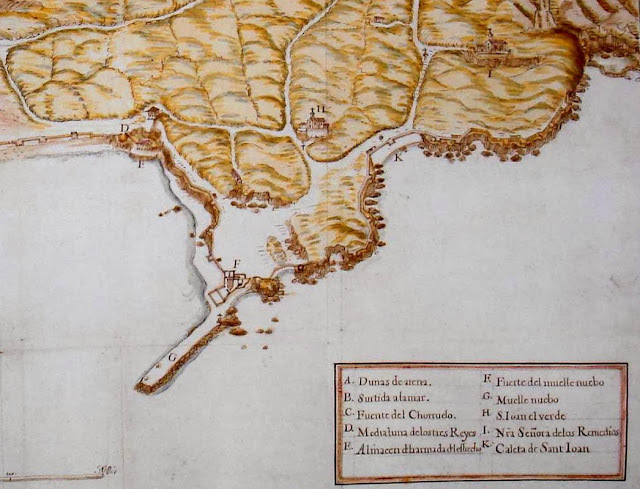 Portillo's is a history of Spanish Gibraltar in the early 17th century but it would be safe to say that his description of this particular area would still have been valid several decades after Gibraltar had been taken over by the British. After this ( a visit to the Naval Hospital situated about a mile out of town beyond the new Mole ) we visited what is here called the Vineyard. It is a pretty large piece of garden, lying upon a descent, in the occupation of one who rents it, maintain himself and his family by the profit thereof . . . . 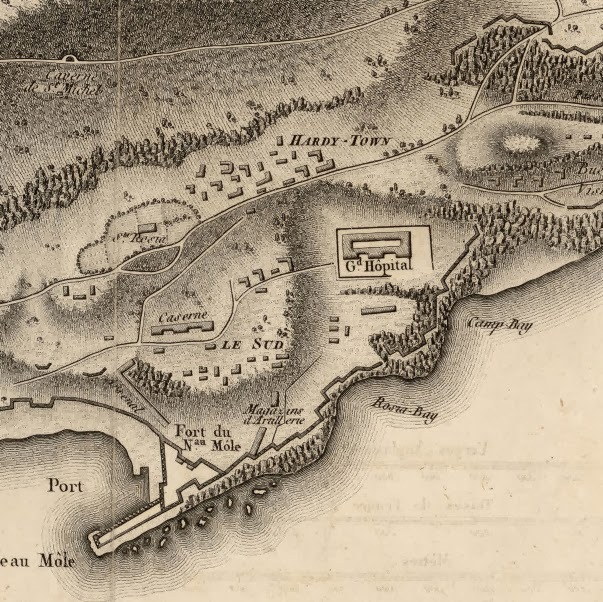 It was Antonio's son George who was in charge by the time Poole came avisiting and his description of the place suggests that its name- the Vineyard - was something of a misnomer. It is probably worth mentioning that the Picardos generally seem to have been superb horticulturalists - to such an extent that one is inclined to suppose that it was this family that gave rise to the local tradition that the Genoese were the best gardeners in town. Agustin for example also owned another 'huerta' inside the moat of Charles V wall. He had bought it from a Spaniard, Ignacio Reyes for 400 duros. His son Giovanni Picardo inherited the place when he died. Nevertheless, a careful scrutiny of the above reveals that although 'houses' and 'cottages' are mentioned, chapels or ermitas are not - an odd omission as the gardens in question were almost certainly those of Nuestra Señora del Rocio. 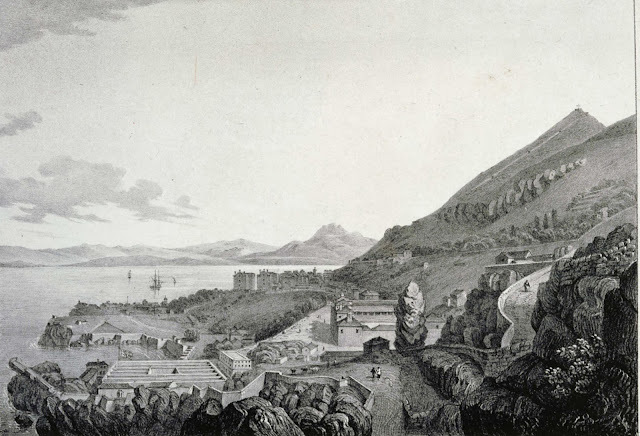 In 1771, Lieutenant Colonel Thomas James (see LINK ) also wrote about his experiences in Gibraltar while he was stationed there for several years during the mid 18th century. His description of the area makes a first clear connection between the Vineyard and its chapel. The 'garden' between South Barracks (see LINK) and the Naval Hospital is almost certainly the Vineyard. It is shown just above Rosia Bay. His contemporary Samuel Ancell in his account of the Great Siege also refers to the garden as George Picardo's vineyard, while acknowledging both its money making potential and its limitations in time of war. Near the New Mole . . . is a pleasant vineyard, of a small length, which yields a great quantity of vegetables, but not sufficient to supply a sixteenth part of the garrison. It is supposed that the owner clears five thousand dollars per annum by it. From the 19 th century onward, however, neither the chapel nor 'the Vineyard' continue to appear in either maps or the literature. Presumably they either no longer existed or were of too little consequence to mention. In 1977 local historian George Palao wrote an exhaustive survey of all the pre-1704 churches of Gibraltar. It included Nuestra Señora del Rosio - which he translates as Our Lady of the Dew and describes as follows. Which is not where everybody else places it. He gives no reference and if one takes it for granted that he was not mistaken, then one must suppose that there might have been more than one chapel called Rocio/Rosio/Rosia/Rosa. Unfortunately I cannot find a single pre-British map with the elusive chapel on it. 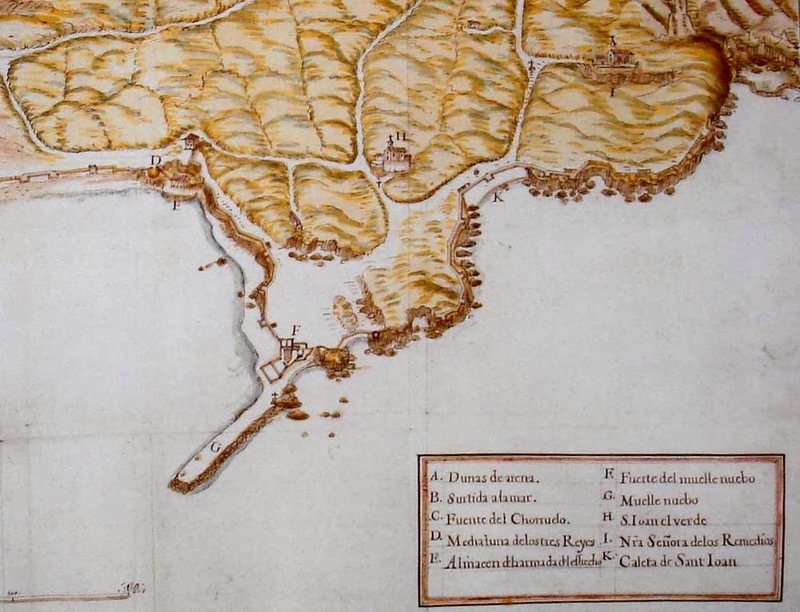 A map produced in 1608 by the Spanish engineer Cristóbal Rojas carefully positions two nearby churches on either side of it - San Juan ( San Juan de Verde - not far to the south of British map placings of Rosia) and Los Remedios ( Nuestra Señora de los Remedios - not far to the north of British map placings of Rosia). But of Rocio/Rosio/Rosa/Rosia there is no sign. 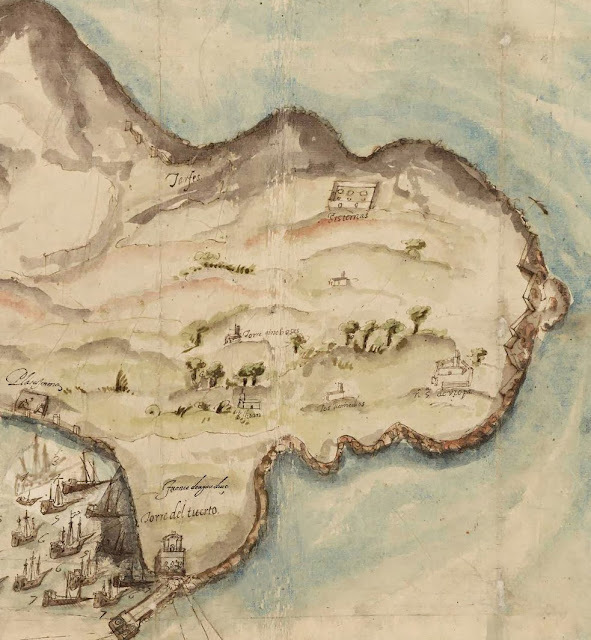 Going even further back the Dutch cartographer Anton van Wyngaerde ( see LINK ) made a series of small sketches of the Rock prior to completing his well-known picture map of the Rock. 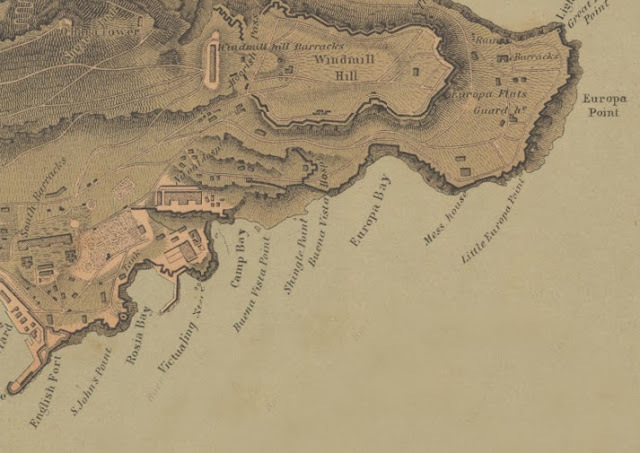 One of these sketches shows the 'Rosia' area. The town is viewed from the south with Sierra Carbonera in the distance sporting its tower. Harder to make out is the Puerta Nueva through Charles V Wall which is indicated by an arrow and the words p nova. On the left hand side the Torre del Tuerto appears as la torra torta . The two churches labelled A and B, are Na Sr de los Remedios and San Juan Verde respectively and the area in front of the churches seems to be labelled Joan Plaza. Once again, no mention of anything remotely like Rocio. Even more unfortunate is the fact that I can find no mention of any chapel called Nuestra Señora del Rocio - or any other possible other alternative spellings of the name - in pre-British histories. Acabando los arenales ( the Red Sands) comienzan las Huertas . . Esta entre estos huertos la Iglesia de San Juan de Verde que es de la encomienda de los Caballeros de San Juan del hospital, que ahora dicen de Malta. . . In other words this elusive chapel seems to have been quite well known during the first century of British occupation but for all intents and purposes practically unknown in Spanish Gibraltar. All this of course does not discard the idea that Rosia Bay was indeed named after a chapel known to the British as Sta Rosia. In fact I would go so far as to say that this interpretation is to be preferred to one suggested by Wikipedia - the internet encyclopedia - which blandly suggests that the bay was named after a monastery town near Sienna in Italy which was also called Rosia . 16 No references are offered and I can find no evidence for this. One rather unlikely theory that would explain the lack of evidence for a Spanish Chapel of that name is that in during the Spanish era it was one and the same as Nuestra Señora de los Remedios. For example the Virgin in the Hermitage in Huelva was once called La Virgen de los Remedios but is popularly known as el Rocio - which in religious symbolism refers not to dew as such but to the 'blessings offered by God'. Perhaps a more likely - and from my point of view as a Gibraltarian a more attractive theory - could be summarized as follows. 1. The church or hermitage was of such insignificance during the Spanish era that it was hardly worth mentioning. 2. After the place and its grounds were handed over to the Picardo family in the early days of the British occupation, it became better known, not as a chapel but because of the its gardens - the so-called Vineyard. That it had probably never been a building of any great size or usefulness is confirmed by the fact that the British never bothered to convert it into either a barracks, a magazine or a store - as they invariably did with other Spanish Chapels - and simple leased it out to a local. 3. 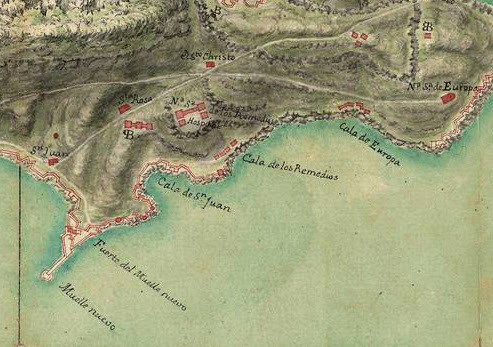 With the passage of time the whole area occupied by the garden from the cliffs to the sea and from San Juan to Los Remedios - itself used as a barracks in the early 18th century - began to be referred to by the British as Rosia. 4. Meanwhile. 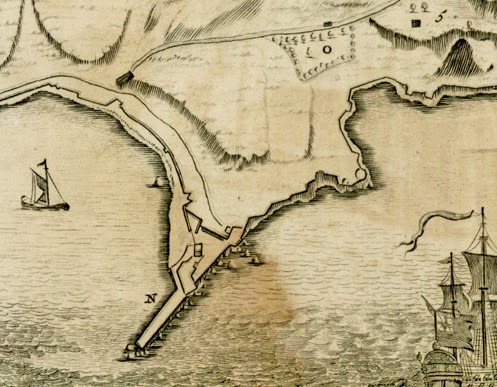 the Bay, Gibraltar's only natural harbour also came into its own as it was used more and more both for commercial and military purposes. During the late 18th and middle 19th century its importance as a naval base exceeded both its size and victualling capacity. 5. And from there one small step to calling it . . . Rosia Bay. And yet, and yet . . . I am still not at all sure that I haven't missed something important.